Tauranga is the western part of the Bay of Plenty, which extends from Katikati and Waihi Beach to Papamoa and Te Puke on the coast and south to the Kaimai ranges. Captain Cook saled into the Bay of Plenty on the Endeavor in 1769, giving it it’s name, because of the number of thriving settlements of friendly Maori people and the amount of supplies that they gave him. 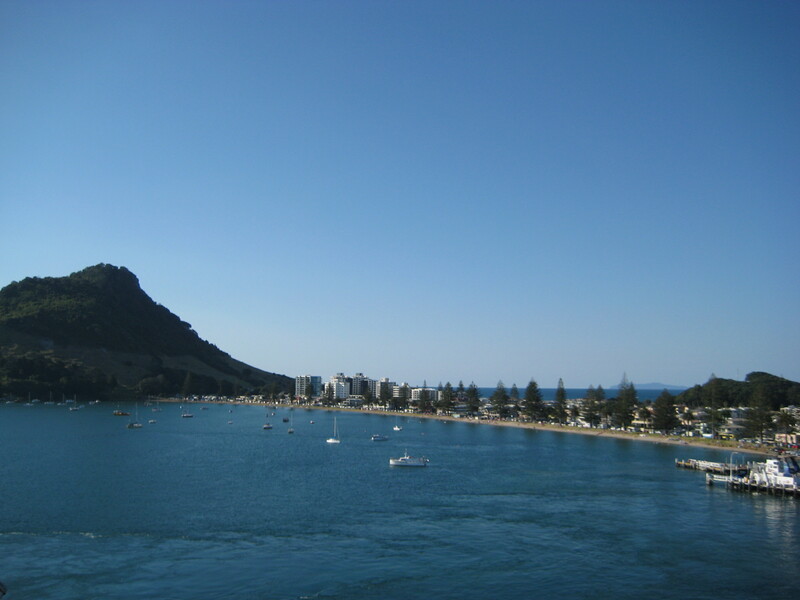 Tauranga enjoys the greatest number of sunny days in all of New Zealand. It is also one of the largest ports in New Zealand, exporting produce from the rich surrounding as well as logs, woodchips, and timber products. It is a very desirable area for retirees attracted by the temperate climate and modern facilities. We were docked at the small town of Mt. Maunganui, which means “Big Hill” and refers to the adjacent hill formed by a volcano, which is about 750 feet tall. The hill has a popular trail around the base, which then leads you gradually up the hill to the top for a beautiful view of the surrounding harbor. Our tour today took us to the famous Waitomo glow-worm caves, which is about a two-hour drive from the port. The caves were discovered by the Maori in the late 1800’s and they have been giving tours of the caves ever since. A portion of the tour is on foot where you see stalactites and stalagmites, but the most impressive glow-worms are seen from a boat on the river. Once you have descended into the caves you are loaded into a small boat that holds about twenty people for a short ride through a couple of caves where the majority of the greenish bioluminescent worms are hanging from the ceiling of the cave. The worms have a very short lifespan of only a few days but are quite unique and a sight to see. Some of our companions thought the caves looked “Disneyish” and others thought the glow came from LED lights! 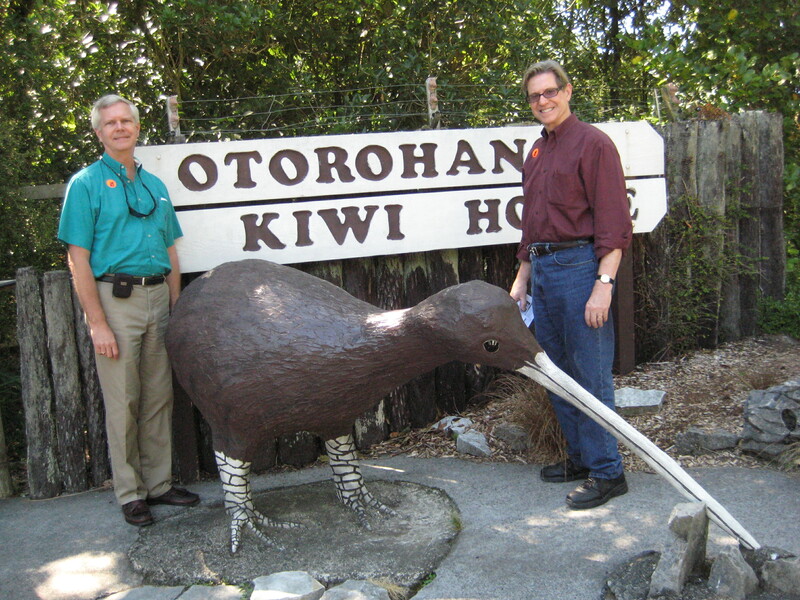 We also visited the Otorohanga Kiwi House where we were able to see the national bird of New Zealand, the Kiwi. The Kiwi is a flightless bird belonging to the ratite order of birds, which includes such creatures as the Emu. The Kiwi is a nocturnal, tailless bird with loosely attached feathers giving it a shaggy appearance. Its nostrils are located at the tip of a long bill giving it a great sense of smell. They also have excellent hearing and eyesight and have cat-like whiskers. They eat mostly beetles, caterpillars, cicadas and spiders as well as berries. The Kiwi nest in burrows where the female lays one or two very large eggs over a period of a couple of weeks. The eggs are about one-fifth of the female’s body weight. The male incubates the eggs over a period of 72 to 84 days when the chick emerges from the shell wearing its shaggy adult plumage. The chick remains in the burrow for six to seven days without food or water. The yolk sac remains attached to the chick at birth and provides nourishment until the chick can venture out of the burrow to eat. During this time the chick will have lost 25% of its body weight. Once feeding commences, it will take 10-15 days for the chick to regain its birth weight. The Kiwi is nearly extinct from a host of introduced predators like cats. 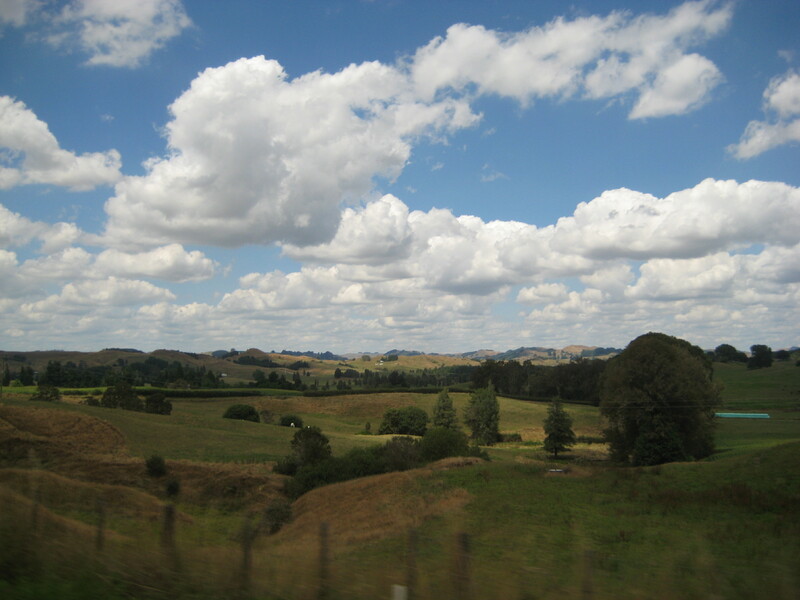 We then headed to the Waikato dairy region where we enjoyed a delicious lunch at the private home of a dairy farmer. Lunch included roasted lamb, meatloaf, potatoes, deviled eggs, green salad, beets, and a dessert of vanilla ice cream with fresh fruit in syrup. Tonight’s entertainment was a comedian by the name of Kevin Jordan who is a former LA police officer. He used his powerful police officer flashlight to see and interact with the audience. He was very funny and different.